On Monday Intel officially announced its new 28-core processor designed for extreme workstations, the Xeon W-3175X. The chip uses the company's high-end Xeon workstation/server sock, LGA3647, and as a result, new motherboards will be needed for the chip. 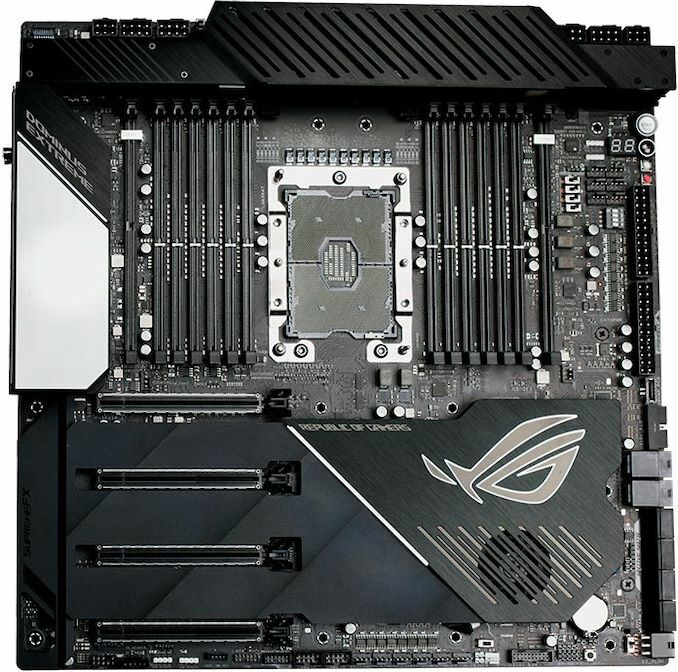 To that end ASUS has officially announced what will be among the first boards to support the new platform, the ROG Dominus Extreme. As we noted when we covered the new Intel Xeon W-3175X 28-core processor on Monday, the ROG Dominus Extreme is advertised as having four full-length PCIe 3.0 slots, all of which have full x16 bandwidth available. This means users looking to create a cost-is-no-object and all-out gaming system can run up to four-way SLI and four CrossFire multi-graphics cards configurations, or other crazy setups involving numerous high-bandwidth cards. The area around the PCIe slots has a coating of armor which stretches across the majority of the bottom side of the board with a cooling fan integrated into the armor covering the chipset. The new Dominus Extreme follows the larger sized EEB (14" x 14") form factor, and ASUS has done their best to maximize the feature set to complement the ROG mission to gaming, though still following the general remit expected from a model based on an extreme workstation socket such as LGA3647. We already know the new Intel 28-core Xeon W-3175X has a massive TDP of 265 W, and the ROG Dominus Extreme is designed to cope with this and more with a clear focus on overclocking performance for the new chip. Providing power to the board is a pair of 24-pin ATX 12 V motherboard power connectors, with a further four 8-pin and two 6-pin 12 V ATX CPU power inputs which suggests that when overclocked, the Xeon W-3175X is going to draw a lot more than 265 W.
The ASUS ROG Dominus Extreme will feature a plethora of features to satisfy gamers and power users, with support for up to 512 GB of ECC or non-ECC system memory across twelve RAM slots, and we already know the new Intel Xeon W-3175X features a six-channel memory controller. 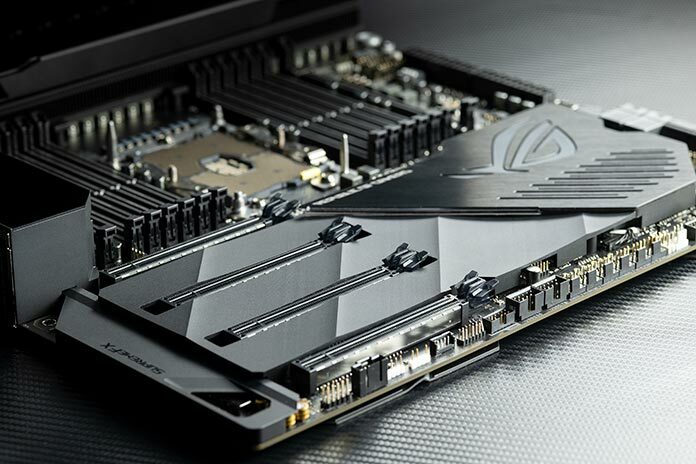 The memory slots are complemented by what ASUS calls their ROG DIMM.2 slot, a series of M.2 riser cards which offer room for up to four M.2 slots. Also featured is a pair of U.2 ports. The power delivery is advertised as having a 32-phase design with four hidden fans which are controlled thermally, meaning they will only spin up when the situation requires it. An 'overclockers toolkit' located in the top right corner. In this toolkit of sorts are PCIe lane switches which allow users to enable or disable individual full-length PCIe 3.0 slots, a pair of dedicated power and reset buttons, as well as an LED debug for diagnostic purposes. 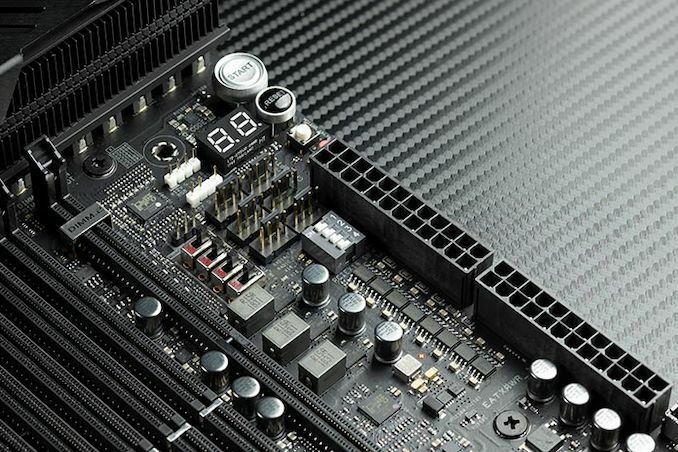 As expected with a workstation-level motherboard, ASUS has included a total of twelve 4-pin fan headers throughout the PCB, with six of these located in the top right-hand corner of the board. Sitting next to these are various monitoring headers for use in temperatures flow monitoring for water cooling, as well as leak detection on compatible and supported CPU blocks. Visual features include a 1.77" LiveDash OLED, which is designed to give the board a more premium feel. Full ASUS AURA Sync RGB support is also present, which is featured on the majority of the ROG based models. Featured on the rear panel is an Aquantia AQC107 10 G LAN port along with an Intel AC-9260 802.11ac Wi-FI adapter capable of achieving 1.73 Gbps. For the gamers a Realtek based SupremeFX S1220 HD audio codec offers up to 8-channels, and we know the Dominus Extreme will have USB 3.1 Gen2 Type-A and Type-C ports implemented into the mix. 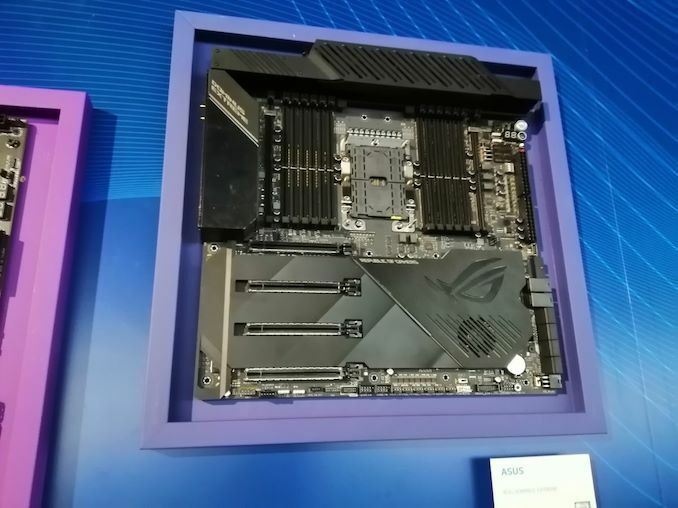 The pricing and availability of the ASUS ROG Dominus Extreme is currently unknown at present, although there are rumours the board will be released in December, with more information expected in the coming month. Not really, AMD Threadripper is killing it.